A host of your favourite England players have been surprising customers across the country by making Waitrose shopping deliveries within their local communities. Unsuspecting customers have received deliveries from the likes of Jimmy Anderson and Jonny Bairstow as well as a lucky few receiving tickets to watch England play at a Test match at their local ground. The bowler picked and packed food orders at Waitrose Wollaton, Nottinghamshire, then jumped into the van to help deliver food shopping to the local area, with delivery driver Patricia Poole. Steven Finn delivers groceries for Waitrose John Barnes, across North London ahead of the Lord's Test match against Pakistan. Customers across Leeds were in the safe hands of Jonny Bairstow as he helped Megan Wright deliver groceries from Waitrose Meanwood. 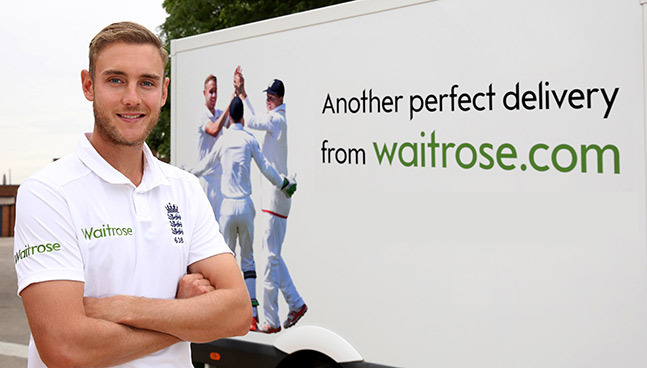 Chris Woakes helps out in Waitrose Hall Green in Birmingham. The England all rounder spent the day helping in store and made a surprise customer grocery delivery ahead of the Edgbaston Test match against Pakistan. Jimmy Anderson joins Waitrose in Greater Manchester ahead of the Emirates Old Trafford Test Match. Jimmy delivered groceries for Waitrose Altrincham, Greater Manchester to surprise lucky customers ahead of the Old Trafford test match.